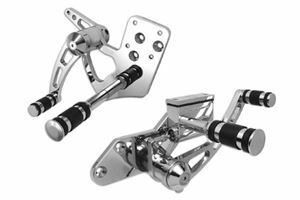 Chrome Billet 3" extended set includes rubber belted foot pegs, left and right sides complete with master cylinder. Shift rod and brake lines sold separately. Brake switch modification and line replacement is required. The master cylinder will accept a standard 10mm banjo bolt. Some hardware and shifter linkage may have to be purchased separately for proper fitment. **NOTE: When installing extended forward controls on a motorcycle, make sure all clearances are checked.